A lot of you are probably looking at that title thinking, “Hmm…I think I’ve read that.” And maybe you have. But this is not the Mary Balogh book by the same name. This Counterfeit Betrothal is a Signet Regency by April Kihlstrom. I picked up this book expecting the standard fake engagement fare: the hero and heroine meet via some awkward circumstance that they plan to circumvent via an engagement that later on or the other of the will break off except they inconveniently fall in love. In other words, I expected the fake engagement to be fake from the beginning of the engagement. It isn’t. This fake engagement starts as a real engagement. The hero, Jeremy, is a rake on the outs with his father, who thinks he has gotten too wild and threatens to cut off his funds if he doesn’t marry. The heroine, Emmaline, is willing to go along because it would make her dying father happy. It looks for all the world like these two are going to be married by page 22. That’s when the fun starts. The heroine’s unhappily married sister tries to dissuade her from marrying a rake and it worries the heroine enough to propose a new arrangement–that of keeping both fathers happy all the while planning on breaking things off in a few weeks. I don’t want to summarize the entire plot, but this one started to remind me of As You Like It about halfway through. The relationships between hero and heroine, hero’s best friend, heroine’s best friend, hero’s best friend’s mother, heroine’s best friend’s mother, the heroine’s best friend’s soon-to-be-betrothed and both the hero and heroine’s fathers get positively Shakespearean. Considering the sweet, slow start, I was very surprised when the book devolved into this highly amusing tangle of fake relationships, everyone thinking everyone else was after someone they actually weren’t, schemes and planned elopements. It goes from bland, though sweet enough, to delightfully bonkers once the pair hits London. My biggest criticism of this book pretty much has to do entirely with its age. There are moments when the heroine is being stubborn and the hero is being pig-headed and he manhandles her a bit, including with a punishing kiss or two. Once he does so because the heroine refuses to quit mentioning his former mistress and he shows her (mildly) how he would treat a woman of the night. It isn’t good and doesn’t show him in the best light, but it doesn’t get very far. The thing is, it’s a book from 1987. I’d be more surprised if there wasn’t a scene like that. But as that sort of scene goes, it’s more offensive than genuinely upsetting in my view. And it’s very brief. It’s also available in ebook! The cover of the paperback I have is, uh, nicer, but I’d assume the book is the same. 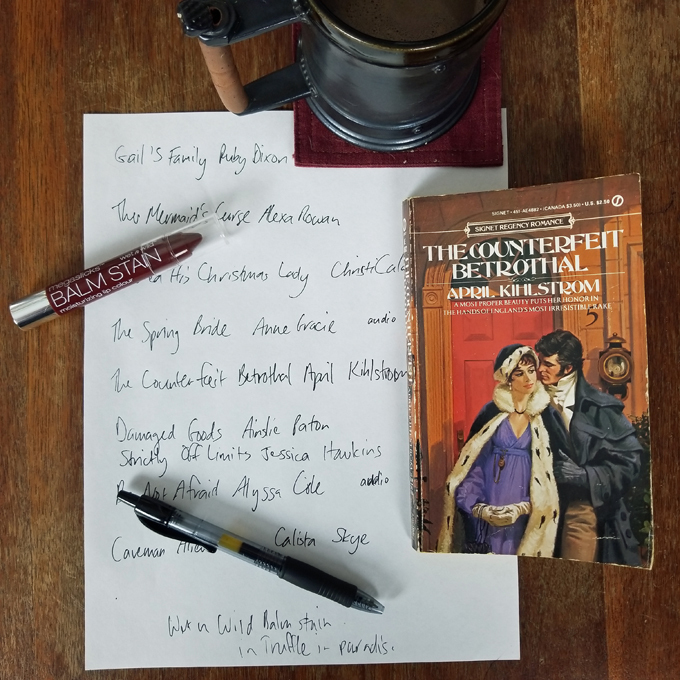 If you love trad Regencies or have never read one and want to try one out, I can definitely recommend The Counterfeit Betrothal. If you want to see what else I’ve been reading off my TBR this month, you can check out my new YouTube channel! Today I review books by Ruby Dixon, Alexa Rowan, Christi Caldwell, Anne Gracie, Ainslie Paton, Jessica Hawkins, Alyssa Cole and Calista Skye, all off my TBR pile, and talk about why I’m not sad to have cancelled Kindle Unlimited. I love pulling out older titles to see how they compare to what we read today. Glad this one met the test of time for you. I am quite intrigued now. Despite the punishing kiss, it seems as if the writing, characterization and plot worked well for you, and I am quite tempted. I must read at least a handful of books from my own neverending TBR mountain range before I indulge with a new book, so I’ll have to remember to come back to grab that link–’cause you sold me on this one!